Hi All! Just thought I’d post a quick and easy yet impressive dinner that I pulled together the other night. 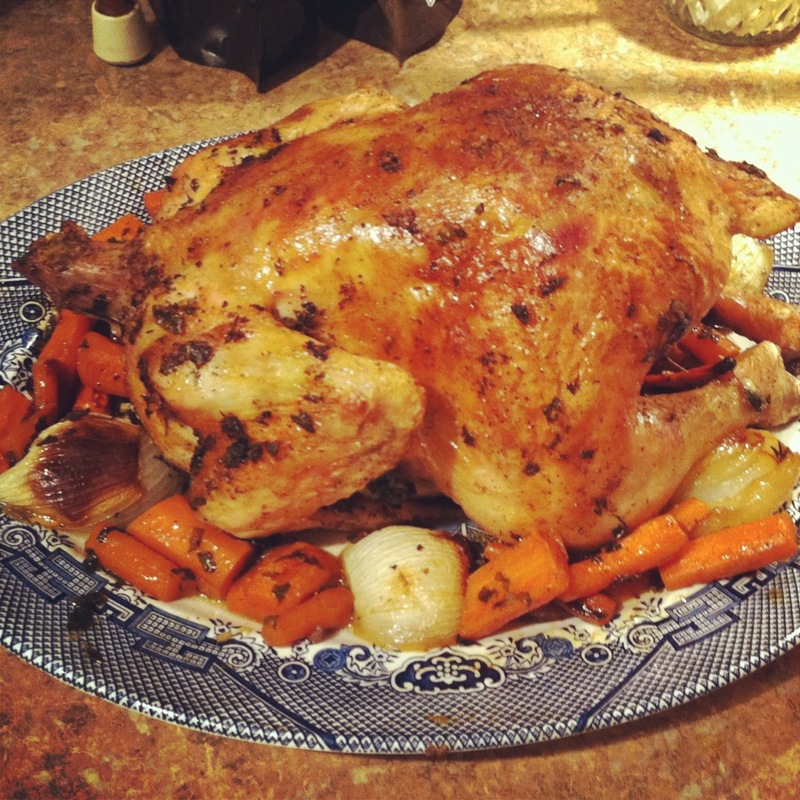 It’s a lovely roast chicken that you could serve on a Sunday to company but also makes a week night meal really special. The tomato side dish was almost too easy to consider a recipe but what the heck… It was in Ina Garten’s cookbook so it has to be good! Preheat your oven to 425. In a 9×13 baking dish place onions (except for 1 or 2 quarters), carrots, and half the sprigs of thyme. Drizzle with olive oil and a little salt and pepper. Set aside. In a bowl, combine the butter, garlic and herbs with small spatula until well mixed. Generously salt and pepper the inside cavity and outside of the chicken. Fill the cavity with the lemon, onion, and remaining thyme sprigs. Tie the legs together with kitchen twine. With your fingers, gently separate the chicken skin from the meat creating pockets. Do this at the breasts and also along the back or “top” of the bird. Using your spatula, scoop out some of the butter mixture and stuff it into the pockets so it’s directly against the meat. Massage it in. Place the chicken on top of the carrots and onions. Spread the rest of the butter all over the chicken. Roast for 1 1/2 hours or so until the chicken is golden brown and cooked through. Serve on a platter surrounded by the roasted vegetables. 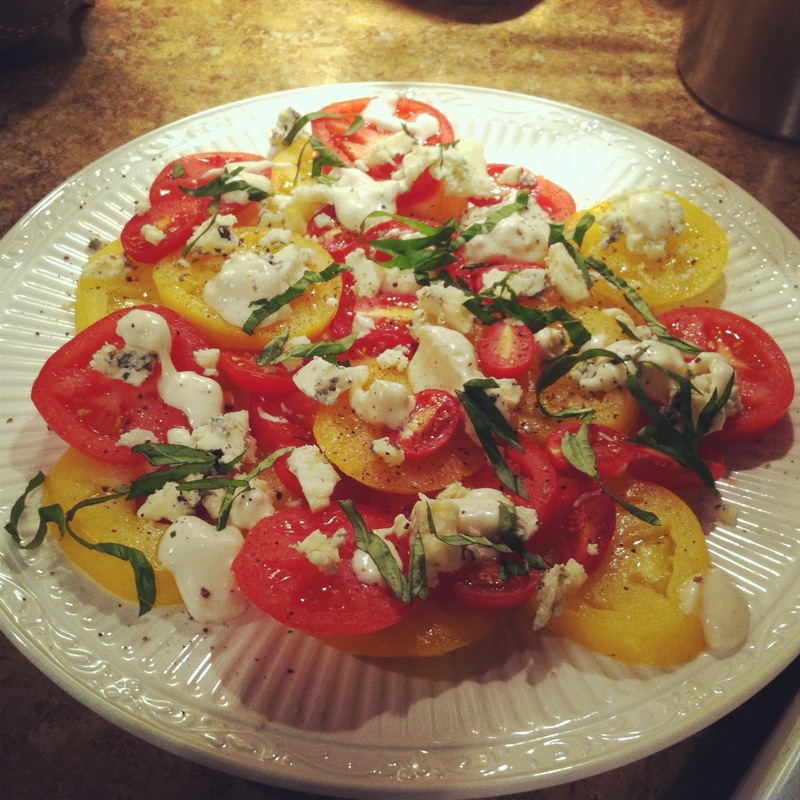 Cut the tomatoes into thick slices and arrange them nicely on your plate. Strew the blue cheese crumbles all over the tomatoes. Top with blue cheese dressing but not too much. Add salt and pepper to taste. Stack the basil leaves and then roll them up into a little cigar shape. Slice the cigar thinly so the basil is in little strips. Sprinkle over the top. 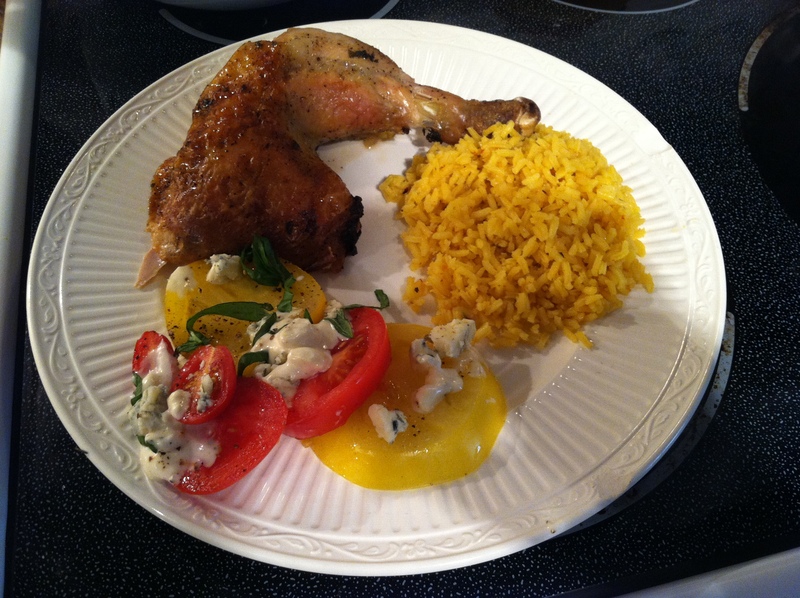 I also made some yellow rice to accompany the chicken and I think it was perfect. A side of buttered noodles would have been nice as well. Enjoy this meal soon!